Canada day was unexpectedly awesome. I was expecting a hard day—I am still in the “a year ago at this time” part of the post-divorce life, and the Canada Day fireworks are special to me. I was expecting to be without anyone from my family, and I was sad about that. But the evening turned out beautifully… two of my sons and one daughter-in-law and one dog and I walked to the fireworks along a beautiful riverbank under a glorious Saskatchewan sunset. It was one of those it’s-not-how-I-envisioned-but-I-show-up-and-we-make-good-things-anyway moments. Along the trail, we came across an art exhibit, made of huge printed images on wood, of people climbing a bank that looked exactly like the one we were on. They looked like refugees, except I did not think so, because we don’t get a lot of refugees arriving on the banks of the South Saskatchewan river. Upstream is Edmonton. People usually just drive. And not that many of them, because Edmonton is a pretty nice place. There was a QR code beside the sign, so we scanned it, and learned that the series of images were real images of refugees arriving at various places in Canada. Audio of border officials explaining peoples’ rights. They sounded super civil and kind. (In fact, a friend of mine who arrived as a refugee said that when he got here he experienced “the nicest interrogation of my life”). I thought about how my own “not what I was planning” sorrows were pretty minor by comparison. And about how well Canada treats refugees (at least, from the tiny audio clip I heard, which I felt made me an expert). I felt Super Dee Duper about my country. Sitting watching fireworks, eating a falafel wrap that I can only describe as immediate and powerful evidence of the goodness brought about by immigration, I felt super smug. We do not rip children from parents and put them in cages that we euphemistically call “boarding schools”. We haven’t done that in… well, I believe it’s thirty full years now. Canada day is always a mixed bag, because we have our own list of things to be ashamed of. Things to rebuild from. But bad things don’t take away good things. As a nation of nations, we are moving in a good direction. July 2nd was unexpectedly sad. … Which now lay flat on the ground, covered in black spray paint. We stopped our bikes and looked down at it. “Wow. Some jerk got really drunk last night.” Anthony said sadly. Sort of. The sign wasn’t just pushed over, though… it had originally been held up by two by fours, and those two by fours had been sawed through by a circular saw. A nearby jogger stopped, and asked what we thought happened. I said, sarcastically, that someone got “overly patriotic”. “That’s not my idea of patriotic” the jogger shot back instantly. I clarified, of course, and she told me about talking to her kids about refugees and how the only difference between us and them is luck. We sat there reflecting on how strange it is that—in the words of Glennon Doyle—“We are people born on third base convinced we hit a triple”. This is not the country I was thinking we were, as I sat smugly with my falafel under the fireworks. This is a mixed country. 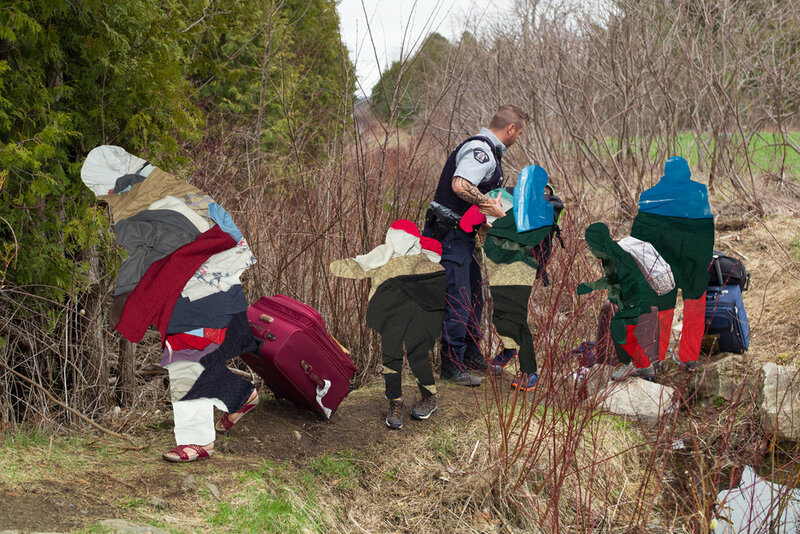 This is a country that adornes the path to the Canada Day fireworks with art that reflects the perspective of refugees, and honours their courage. We are also a country where some jackass brings a skill saw and spray paint to smear that message with one of intolerance. Dear Jackass, you are not a part of my country. Except, dear Jackass, you are a part of my country. I tell him it’s not broken forever. That we will call the city, and that whoever built this the first time will build it again. And he looks at me, and I think that the signs are the simple fix. I can’t figure out how to rebuild his confidence in his country. I can’t figure out if I want to. As a parent, I never know how to strike that balance between disillusionment and hope. Maybe disillusionment and hope aren’t opposites. Maybe they’re strongest when you hold them together. Dear Jackass-with-skill-saw, you are a part of my country. I have no idea why you came with your spray paint and blades, but let me tell you what you built. You built a spot on the trail where hikers meet to talk about what they imagine it would be like to be refugees. To talk about the welcome we want to provide to the people who need it, and to talk about the fact that as a society we are not fully there yet in terms of that welcome. A spot where many of us—myself include—think about the welcome our ancestors received when we arrived, and the terrible price some people paid for that welcome. A spot where we resolve to do better. I tell my son that a good country is not made by having no jackasses with skill saws. That every group of people has it’s jackasses, (and that you do your best to minimize the days when you yourself are the jackass—because we all have those days). I tell him that a good country is not made by having nobody with spray paint and skill saws. We cannot make sure nobody knocks down the signs at night--and that's not what matters most, anyway. A good country is made the next day. A good country is made by showing up, repainting, and trying again. July 2nd was also one of those not-how-I-envisioned-but-we-make-good-things-anyway moments. Liked this post? You might also like The Pink Pants Principle, which is another parenting one, or I'm So Glad We Had All Those Bedbugs, which is about, er, Donald Trump. And hope.